Heat the butter/ghee and toast the almonds until golden. Drain and set aside. To the same pan add the condensed milk and desiccated coconut. until the mixture turns quite thick and starts to roll into a ball. This took me about 8 mins but will totally depend how much heat you are using, type of pan, etc. The mixture will stick to your spatula and generally refuse to get stirred anymore. At that point, give in and turn off the flame. Add the roasted almonds, mix them in and let the mixture cool enough for you to handle it. 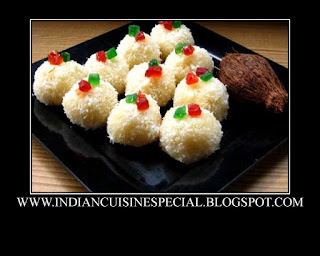 Make ladoos of the desired size and roll them in more desiccated coconut. You can grease your hands with some soft butter or ghee if the mixture is sticky but if cooked right, it shouldn't be hard to shape them. If the ladoo mixture is too sticky, return to the pan for a while longer and cook until ready. Transfer to an airtight container and let them cool completely. Refrigerate for up to 4 days, just remember to keep them out for some time before consuming since the ladoos turn a bit hard when refrigerated.